The Sailing Academy’s exceptional and experienced instructors and staff are one of the most valuable qualities of the program. Pedro Luis Fernández was born in Cuba and represented his country in more than three Central American and Caribbean Games and three Pan-American Games. In 1996 he won a Gold Medal at the Pan American Games and later went on to compete in the 1996 Olympics in the 470 class. As Puerto Rico’s national coach for the past 5 years, he has led the team to 10 medals in the Central American Games and Pan American Games. 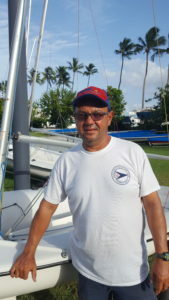 Pedro Luis is considered one of the best and most experienced sailing coaches in the world. The Sailing Academy is backed by a number of qualified instructors who know how to teach sailing from the most basic level to the more advance advanced level. They all have extensive experience competing at international regattas.